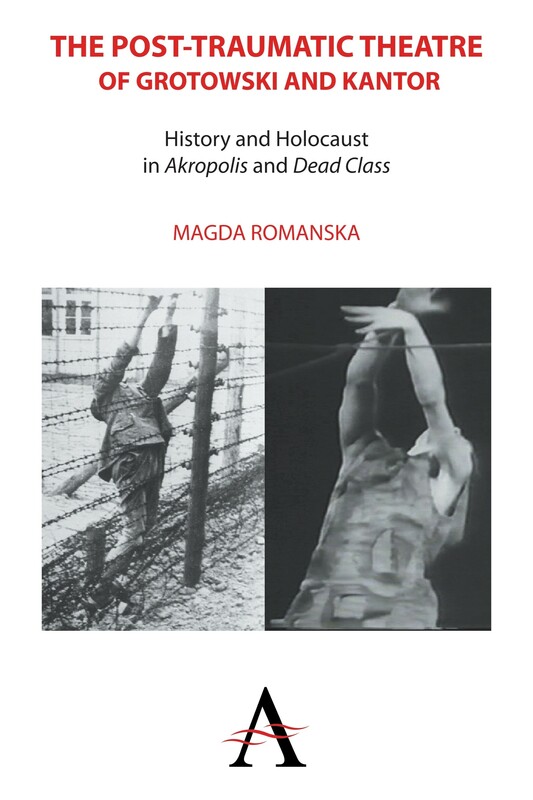 This book is a historical and critical analysis of the post-traumatic theatre of Grotowski and Kantor, examining the ways they represent Auschwitz in their respective pivotal works ‘Akropolis’ and ‘Dead Class’. Q: Kathleen Cioffi writes that your book manages to ‘reclaim both the Polishness and the Jewishness of Grotowski’s and Kantor’s chefs-d’oeuvre.’ How would you describe the work of these writers as particularly Polish/Jewish? Magda Romanska: The work of both directors is strongly embedded within the framework of Polish literature and culture. However, historically, Polish culture and literature were embedded within the framework of Jewish tradition. Before World War II, the Jewish and Polish cultures intermingled for over a thousand years. It was often impossible to distinguish between the two, they were so interconnected. Both Kantor and Grotowski weave in the two motives in visual and textual tapestries that pay homage to this millennial history, including the Holocaust and its aftertrauma. Q: For a long time ‘any attempt to discuss them [Grotowski and Kantor] side by side not only seemed impossible; it seemed like a sacrilege.’ Why did you choose to analyze these two writers together? MR: Both Kantor and Grotowski are towering figures in Polish and European theatre. During their lifetimes, they were mutually respecting rivals. When Grotowski first saw Kantor’s Dead Class, he said, jokingly, “Unfortunately, I have to admit this is a masterpiece.” Kantor, on his end, was less generous, regularly referring to Grotowski as a “charlatan.” They also represent two antithetical aesthetic and theoretical poles of theatrical discourse. Each pushed his experiments to the opposite extreme in his approach to the human body, space and performance. Their worlds are like two binary signifiers: neither can be fully understood without comparing it to the other. Q: Kantor wrote that ‘theatre needs to be universal to be national,’ yet your main focus in this work is to bring the works back to their national origin. Would you then renounce the universal appeal that has been ascribed to Grotowski’s plays in particular? MR: It’s a much-repeated cliché that theatre—any art, really—needs to be specific to be universal. Robert Pinsky has a talk: “When Does the Specific Become Universal?” It’s one thing to make the work relatable (an approach that implies equality, parallel tracks), but it’s another to see it merely through the prism of your own culture (an approach that implies inequality). What happened to both Kantor’s and Grotowski’s works was that their specificity got lost in that type of imperial-like attitude, which dismissed the Polish and the Jewish roots of their theatre as backward. Certainly, both Kantor and Grotowski are part of the European avant-garde, and their work blends in many elements of world theatre; but it is rooted in the rich, profound and multicultural legacy of Central European culture—the same legacy that gave us Kafka, Musil, Conrad, Schulz and Freud. Martin Scorsese said recently about Polish cinema: “There is, I think, such a thing as a national or cultural voice. I don’t think it’s something that’s manufactured, it’s just there. I mean, it speaks through the pictures that they create, the words and the music. So there’s a strong tragic sense in Polish cinema, but it seems to be in balance with very, very strong strains of a spiritual resilience and also a dark comedy.” The same can be said about Polish theatre. Q: Central to your analysis seems to be that ‘theatre cannot be analyzed outside of its cultural context.’ How important do you think it is to know as much as possible about a culture and a language of a play to be able to truly comprehend and appreciate it? MR: Artists are free to interpret any work of art in whatever way they wish, but scholars don’t have that luxury. It’s impossible to imagine a Chekhov specialist who doesn’t speak Russian, or a Proust specialist who doesn’t speak French. Yet, Polish art and literature (and often, any art or literature that belongs to historically marginalized cultures) is often treated as an afterthought, taught by experts who don’t speak the language. Scholars are a type of avant-garde (in the original meaning of the word—the first guard), the first line of interpretation, often providing a blueprint of scholarship and research for others to learn and to interpret. They can’t really take shortcuts. As an artist, I often wander off from the context, as far as my imagination takes me. As a scholar, I need different strategies. Q: Do you think that the lack of cultural understanding is predominantly responsible for the failure to analyze the works in their historical context until now, or are there other contributing factors that might account for this? MR: Many factors have contributed to misunderstandings around Grotowski and Kantor. These include historical, political and cultural issues. Q: By calling the theatre of Grotowski and Kantor ‘post-traumatic’ you place your analysis not only in a historical but also a psychological context. In what way do you think this is essential for understanding their work? MR: The idea of post-dramatic theatre was first introduced by Andrzej Wirth, a Polish theatre theorist and the founder of the famous Institute for Applied Theatre Studies in Germany. Hans-Thies Lehmann was one of Wirth’s students. Both Wirth and Lehmann, however, were influenced by a Hungarian theorist, Peter Szondi, whose definition of Drama, as defined in his Theory of Modern Drama, provided the framework for Lehmann’s concept of the post-dramatic. In Drama, the dramatic universe remains enclosed within itself. Drama is Absolute: it creates its own reality in which the external ties either with its author or its audience disappear. In Drama, the accidental becomes absorbed into the dramatic universe (the accidental ‘makes sense’ in the context of the Drama). Drama is primary: it is not pre-given; it comes into being as it happens. Consequently, Drama generates its own internal time. The term ‘postdramatic’ denotes a rupture between drama and theatre (text and performance). Likewise, trauma is defined as a violent rupture in the social and psychological order that fundamentally alters an individual’s concept of the self and the world. Just as postdrama is no longer bound to theatre (“there can be theatre without drama”), the traumatized individual is no longer bound to the world that betrayed him. What is the rupture that made the post-war theatre postdramatic? Q: Why would you recommend your book to students? What do you hope they gain from reading it? MR: Kantor and Grotowski are very influential figures for contemporary world theatre. Akropolis and Dead Class are both considered masterpieces of twentieth-century theatre. I hope that by reading my book, students will be able to discover the roots of some of the modern trends and movements. This in turn will inspire them, I hope, to put their own twist, their own interpretation, on the aesthetic and theoretical framework of their work.